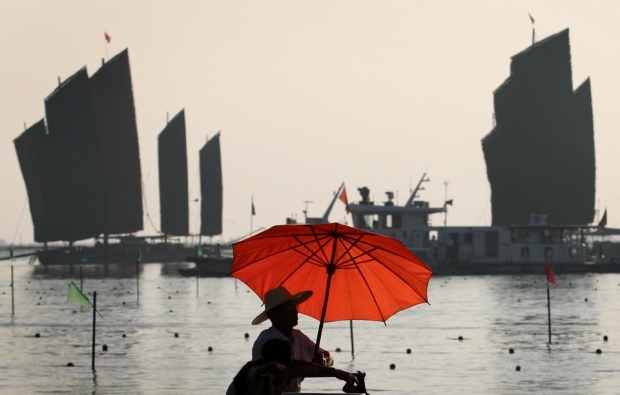 Traditional fishing boats sail across Hongze Lake along with more modern vessels in Jiangsu province. Modernization and a burgeoning consumer class among China's rural population is beginning to unsettle climatologists. Craig Simons was a 2011 Fellow with the Alicia Patterson Foundation. This article was originally published on AliciaPatterson.org. TUOJIA VILLAGE, China—When you think about China’s growing greenhouse gas emissions, you probably don’t think of people like Zhang Chao or his father Zhang Dejun. Zhang Chao, a thirty-five-year-old middle school teacher living in small city in southwestern China, earns the equivalent of $630 a month, only began air-conditioning his apartment last summer, and always hangs his clothes outside to dry. His father has an even smaller carbon footprint. The sixty-four-year-old farmer began using electricity in 1982 and ever since has used it sparingly: Between 2006 and early 2011, the meter nailed to his farmhouse south of the Yangtze River recorded only 470 kilowatt-hours, the amount needed to keep a single 100-watt light bulb glowing for seven months. Not only does Zhang Dejun not own a vehicle, his village has no roads. Yet the two Zhangs highlight the forces driving China’s emissions of greenhouse gases—pollutants, including carbon dioxide and methane, contributing to global warming—to levels that could swamp the developed world’s contribution. China’s emissions of carbon dioxide, the most important of the manmade greenhouse gases, tripled between 1990 and 2009 and surpassed the United States in 2007, according to the International Energy Agency, a think tank formed by twenty-eight nations. The group estimates that if China achieves its current economic plans, its demand for energy—almost nine-tenths of which is powered by burning fossil fuels—will almost double again by 2035, likely adding the equivalent of the current total of U.S. emissions. Some experts have begun to warn that China’s gargantuan growth could leave it producing as much as half of the world’s total emissions within several decades. Nicholas Stern, an economist who has studied climate change for the British government, said in March that if China maintains its current plans, by 2030 it would emit “nearly half” of the planet’s annual budget if the world is to have a fifty percent chance of limiting its temperature rise to two degrees Celsius, a level many scientists believe could prevent the most serious climate shifts. Since China will account for only one-fifth of the world’s population, “it’s very unlikely that the rest of the world—the 80 percent—would squeeze into the other half,” Stern said. Xu Jintao, a climate change expert at China’s Beijing University, warned that as hundreds of millions of Chinese—people like the Zhangs—get richer, they will seek energy-dependent comforts widely enjoyed in the West. For example, currently only one in sixteen Chinese owns a motor vehicle, giving the nation a total of just over 200 million. By 2030, that figure could reach 600 billion, more than twice the U.S. total. In the bigger picture, China’s surging carbon emissions underscore how its pent up consumer demands have reconfigured the calculus of environmental change: As China has maintained three decades of unprecedented economic growth, it has outstripped its resources and begun scouring the world for more, in the process becoming the top consumer of everything from coal and logs to shark fins and tiger bones and its top producer of a wide range of pollutants including carbon dioxide and mercury, a potent neurotoxin released when coal is burned. The drivers of China’s rising emissions can be found in out-of-the-way places like Tuojia. A hamlet of a dozen farmhouses in Chongqing municipality, a Maine-sized state roughly in the middle of China, Tuojia looks much like a traditional Chinese scroll painting: On a recent winter day, farmers planted potatoes by hand in freshly tilled fields, smoke curled from cooking fires, and pigs scavenged for food. But scratch below the surface and you find tensions transforming the village. The most important shift is demographic: The village population has shrunk by one-quarter over the last decade as younger people move to cities in search of work and excitement. “You can’t make much money here, so people leave,” Zhang Dejun explained. Across China the same story is repeated tens of millions of times. According to the McKinsey Global Institute, the economic research arm of the McKinsey consultancy, more than 350 million Chinese will move to cities between 2009 and 2025, creating the greatest single act of urban development the world is ever likely to witness. That infrastructure alone will require a massive investment of energy. More than two-thirds of China’s energy is used by its industries, including the world’s largest national production of both steel and concrete. As China finishes its construction boom, those energy-intensive demands will shrink, but average consumers will take up the slack. On average, urban Chinese use more than two and a half times as much energy as rural Chinese. According to McKinsey, China’s cities will need to build as much as 900 gigawatts of “new coal-fired power” generation between 2005 and 2030, an amount roughly equal to 90 percent of the total electrical generation capacity in the United States. Zhang Chao’s story is indicative of the future pressures. He moved from Tuojia village to Sichuan province in 1996. After finishing three years of training at a teachers college, he took a job in a small city, initially earning the equivalent of $40 each month. Zhang is now considering moving into a larger apartment and hopes to travel more. “I want to enjoy my life,” he says. For China, the shift toward an energy portfolio driven by individual consumption rather than industry will make improving efficiency more difficult. Over the past decades the majority of China’s energy was used by power plants and heavy industry, such as the production of steel and concrete, and Beijing has been able to create savings by forcing changes in large factories. Between 2005 and 2010 most of a 19-percent improvement in China’s “energy intensity”—the ratio of how much energy is required to produce a set amount of goods—came from the replacement of thousands of outdated power plants and steel smelting factories with top-of-the-line technologies. But creating efficiencies in hundreds of millions of Chinese homes will be harder. Chinese homes, commercial businesses, and farms now use less than one-fifth of China’s total energy, less than half of the U.S. proportion, and scientists at California’s Lawrence Berkeley National Laboratory anticipate that China’s residential energy consumption will more than double by 2020. Unlike in the industrial sector, the demands of consumers for increasingly greater comforts will “make it difficult to reduce energy intensity in the building sector,” the scientists wrote in a recent report. The dilemma of how China might limit its emissions while its economy continues to grow has made it a focal point of international global warming negotiations. Like the United States, China signed the United Nations Framework Convention on Climate Change, the treaty created in 1992 that seeks to prevent “dangerous anthropogenic interference with the climate system.” But because Chinese were, and are, much poorer than citizens of industrialized nations, it is not required to reduce its greenhouse gas emissions under the current plan. How Beijing will react to increased pressure is unclear, but “it’s a pretty safe bet to say that Chinese energy consumption is going to keep rising for a long time,” said Edward Steinfeld, a Massachusetts Institute of Technology professor who specializes in China’s energy use.